Ryan Gosling’s debut as a director is an ambitious mess. As an actor, he’s come a long way from early films and matured into a capable, brooding, interesting actor who tackles a diverse load of projects. 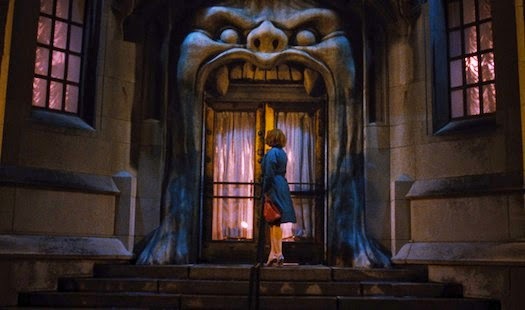 Lost River certainly ain’t The Notebook, and finds much in common with Gosling’s recent collaborative work with director Nicolas Winding Refn. Clearly influenced by Refn, David Lynch, and John Carpenter, Lost River features bizarre and haunting images stretched around a paper-thin plot that holds the viewer at a distance. The town of Lost River is dying, and so are the hopes of Billy (Christina Hendricks), a single mother with two boys living in the decrepit remains of her childhood home. Surrounded by abandoned buildings tottering from neglect, the only things that seem to thrive in Lost River are weeds, rust, and violent thugs. Billy’s teenage son Bones (Iain De Caestecker) earns money by stripping copper from the neighborhood in order to buy parts for his rusty car, though he’s always on the lookout for Bully (Matt Smith), the local small-time gangster. Billy takes on a new job from her banker, Dave (Ben Mendelsohn), who hires her as a performer for his seedy, morbid nightclub known for its pseudo-violent productions. Billy’s desperation is evident; she clearly doesn’t want her sons to know about her job, but she’ll also do anything to keep their house. Bones’ motives are unclear—we’re not sure if he’s trying to save the house, or earn enough funds to help his family escape their deteriorating environment. When Bones discovers an underwater city in the nearby reservoir, he turns to his neighbor Rat (Saoirse Ronan) for insight and friendship, plunging them into a dangerous journey to discover the history of Lost River and break the spell that seems to hold it captive.